One of the most popular and influential genre writers of the pulp era, H. P. Lovecraft was a master of weird fiction, a heady blend of dark fantasy and terror with the occasional science fiction twist. His fans have long since opined the fact that the bulk of his works are long overdue for film adaptation. Ultimately, it shouldn’t come as a surprise; Lovecraft’s stories are more subjective than objective, involve lots and lots of flowery pseudo-antiquated dialogue, and his protagonists have a penchant for fainting in the middle of a crisis — hardly the stuff of mainstream filmmaking. When one of his tales does make it to the big screen, it rarely rises above the cult status of loose adaptations such as From Beyond or Re-Animator. That’s what makes this short feature such a treat; it’s unabashedly a fan-made labor of love bordering on obsessive, one that stays faithful to its notoriously tricky source material while bringing to life a story long considered “unfilmable”. 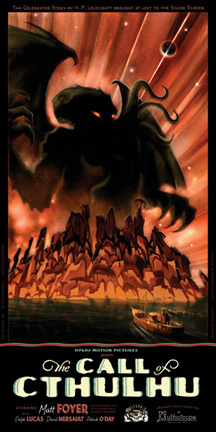 Produced by the H. P. Lovecraft Historical Society, “The Call of Cthulhu” presents Lovecraft’s most well-known tale as a faux silent movie filmed in the year of its publication (1926), one that skillfully mimics the surreal expressionistic style of Robert Weine (The Cabinet of Dr. Caligari), F. W. Murnau (Nosferatu), and Fritz Lang (Metropolis). For the uninitiated, the story centers on the narrator’s (Matt Foyer) investigation of his great-uncle’s death and his discovery of a resurgent cult that worships a malign primordial being. A series of bizarre events ensues, climaxing with a stop-motion appearance of Cthulhu himself. Director Andrew Leman and screenwriter Sean Branney avoid the temptation of tacking on unnecessary or ill-fitting subplots and make only minor derivations from the source; as such, “Cthulhu” keeps it short and sweet at 47 minutes. The cinematography and inventive production design (which makes great use of miniatures, forced perspective, and other simple effects) does a fantastic job of reproducing the look and feel of 1920s-era cinema, and perfectly captures the unique atmosphere of Lovecraft’s tense, nihilistic stories.